In light of recent changes to national careers provision and to statutory regulations, the onus is now on schools and colleges to provide timely, well-informed and impartial careers information, advice and guidance. Lucie Carrington looks at how this can be achieved when schools and colleges work together in the best interests of young people. When pupils at Abraham Guest Academy in Wigan went into school to receive their GCSE results on 23 August, they were offered the immediate, on-site support of a qualified, experienced careers adviser to help them make sense of their results and the opportunities opening up to them. It is not a one-off; from the beginning of this term that same adviser will be working in the academy for 2.5 days a week developing and delivering a careers information and guidance (IAG) programme running across the school. It is all about raising aspirations, says Principal Paul Bousfield. "Currently 70 per cent of our students go onto further education [FE] when they leave us in Year 11. But we feel that the advice they receive could give more of them confidence to go onto FE." Paul knows that this is never going to be the right route for all the academy's students. "We will always have about 10 per cent for whom a vocational approach to education is more appropriate and who need to go into employment with training when they leave us." The academy is not employing its careers adviser directly but is procuring the service from two Wigan sixth form colleges – Winstanley College and St John Rigby College – that have set up a partnership to offer IAG to four local schools. All six institutions are making the most of recent legislation that transfers responsibility for providing independent careers advice to under-16s from local authorities (LAs) to schools. Paul is in no doubt that the service he is buying in will be independent and impartial. "Both colleges are principled, successful organisations that have spotted a local need; they don't have to do this to market themselves," he says. "And it is in no one's interests to direct young people towards unsuitable destinations." Furthermore, the new careers programme will have to operate alongside the academy's existing links with other education and training providers including local employers. However, an assistant head at the academy is also monitoring the quality of the service Abraham Guest is buying in – including its independence and impartiality. Paul is using the service to run a three-phase careers programme – "Dream it; believe it; achieve it". It kicks off as soon as pupils in Year 6 have been offered a place at the academy for the following year and carries them right through to the end of Year 11. "We take pupils from the most deprived areas of the borough so we have some challenging students who lack academic aspiration and we're trying to change that," he says. "From Year 7 on, we want pupils to be excited about how education can improve their future." The principle behind the programme is that, aged 11, youngsters can dream of being anything. By Years 8 to 9, they need to be aware of some of the barriers they will come up against and by Years 10 to 11 students should be clear about how they will get the qualifications they will need in order to achieve their dream. Having outlined the aim of the programme, it will be up to the careers adviser to provide the content and ensure that teachers have the capacity to deliver it. Paul maintains that the careers advice he is procuring will be cost neutral. While there is no extra funding for the new IAG responsibility, schools can redirect money they previously spent on council-run careers advice – which is what the academy is doing. Schools can also use the new National Careers Service, launched at the beginning of July that offers individuals internet and telephone advice. However, Department for Education (DfE) guidance to schools makes it clear that they will not be able to rely solely on this service. In giving them a duty to provide "independent and impartial" advice, the DfE also states that schools are expected to work "with external and expert" providers and, where appropriate, provide face-to-face support. The government also expects schools to provide a variety of careers-related activities such as mentoring, work experience, enterprise clubs, employer talks and local higher education links. Working with the Association of Colleges (AoC), ASCL has produced its own IAG briefing note for school and college leaders – Putting Young People First. It places a strong emphasis on quality, insisting that schools ensure their careers advisers are up-to-date with their professional training and that the service they procure comes with the recognised matrix accreditation for IAG. ASCL and AoC also recognise the importance of collaboration and partnership when it comes to delivering a comprehensive careers service for pupils and students and they have called on schools, colleges and other learning providers to work together to develop, for example, local prospectuses and careers fairs. Most schools have initially opted to buy back IAG from the local authority but, as ASCL and the AoC point out, because this is no longer a monopoly service there is an opportunity for schools and colleges to develop bespoke careers advice for their students. It was not school IAG needs but their own that initially drove the partnership between Winstanley and St John Rigby colleges. The demise of the local Connexions service left them with a gap and they both felt that by appointing jointly they could ensure a more independent and impartial IAG offering to students. "There was no expectation initially that we would provide a service to schools as well," says the principal of Winstanley, Jo Bailey. Two things changed that. First, both Jo and the principal of St John Rigby, Peter McGhee, realised through their individual networks that there was demand out there. "Winstanley sponsors Abraham Guest Academy and they came to us asking if they could work with us rather than the local authority," Jo says. In addition, the careers adviser whom Jo and Peter appointed had extensive management experience and the skill to run a service beyond that for the colleges. 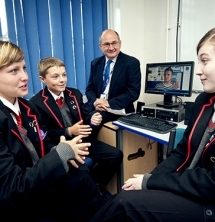 As a result, Winstanley and St John Rigby have appointed two more careers advisers – one full-time and one part-time – to provide IAG services to four local schools: Abraham Guest Academy, Byrchall High School, Deanery Church of England High School and Our Lady Queen of Peace Catholic High School. All three careers professionals have level four industry qualifications as well as extensive experience. Jo is clear about the advantages of what they can offer compared with the local authority IAG service. Flexibility comes top of the list with individual schools deciding how much time they want to purchase and how they will use that time. So while Abraham Guest and Byrchall High School share a full-time careers adviser, Our Lady Queen of Peace has opted for a careers adviser to work with them for only one day a week. "Because careers advisers will have a close relationship with individual schools, they will be highly responsive to their schools' requirements," she says. Value for money is another advantage. At a cost of £15,000 for a half a careers adviser for a year, the service the colleges are offering may not be cheaper than that run by the local authority but Peter McGhee is certain that it will be offering more hours of support and a more tailored service. "I will be very happy if in 12 months schools find they are getting a good IAG service from the local authority but we believe there is also room to provide something different," Peter says. It is too early yet to say how the IAG partnership between Winstanley and St John Rigby will develop. Each school has only signed up for 12 months but more might come on board next year. Neither Jo nor Peter envisage their IAG partnership developing into a large-scale, profit-making activity, however – that was never its purpose. "Our vision is to work collaboratively with key partners and provide a good service that is also value for money," Peter says. "If the demand increased – and there is the potential for it to increase – we would wantto manage any expansion carefully." Further information is also available from the National Careers Service, see https://nationalcareersservice.direct.gov.uk or for a careers adviser call 0800 100900.